How to get the Charter Fishing trip of your dreams! Home/How to get the Charter Fishing trip of your dreams! You have your dates picked out. The perfect condo is chosen. The countdown is on. You have been saving and waiting forever. You have made a list of all the things that you absolutely have to do on your vacation and fishing is one of them, but when you call a marina or charter fishing service, all of the options can be confusing. Don’t worry, we have the answers for you. These are some of the most common questions and how to answer them to make sure you get the charter fishing trip of your dreams. Inshore, offshore, or near shore charter fishing trip? This is the first question that gets asked. The answer will determine more than just your distance from land. It will determine the species of fish that are caught and the size of boats that are available to you . Inshore fishing will generally take place in the bay’s and bayou’s behind the beach. Popular species of fish include redfish, speckled trout, sheepshead, pompano, and black drum. Boats will typically be 20′ to 25′ feet in length with low drafts to allow access to shallow areas. The boats will hold a maximum of 6 people, but tend to fit 4 better. Inshore fishing trips are 4 hours in length and cost between $400 and $600 depending on how many people you have. 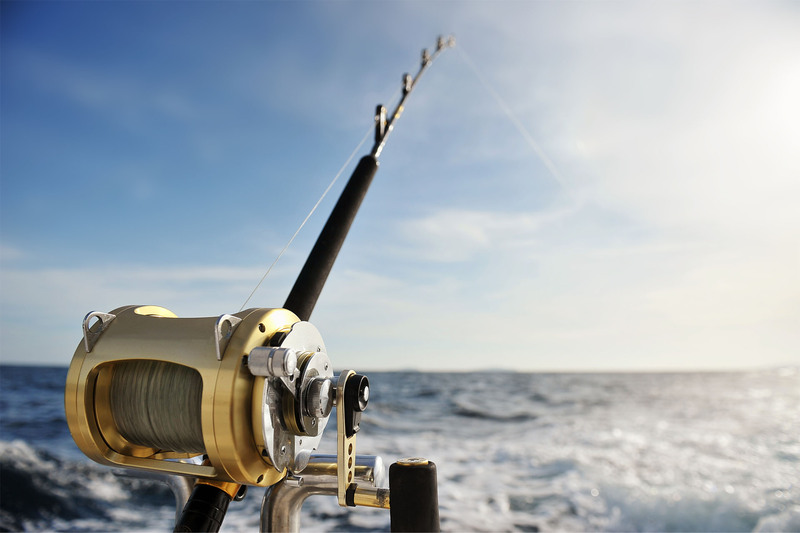 Offshore charter fishing is one of the most popular things to do in Gulf Shores and Orange Beach. The boats range in size from 30′ to 65′ or bigger. 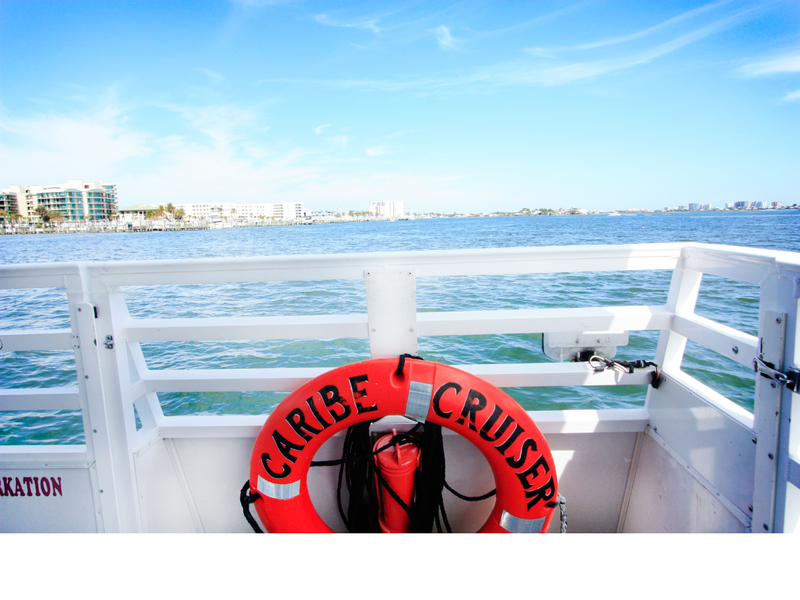 You can expect the boats to have a bathroom on board and some will even have enclosed living quarters that are climate controlled with comfortable seating. 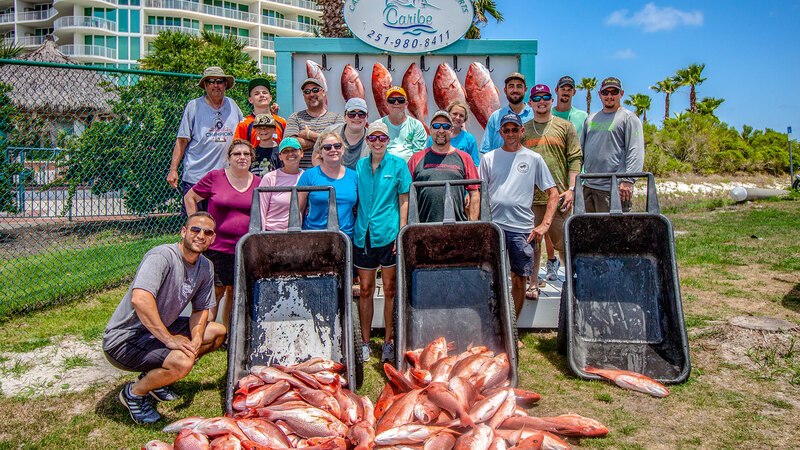 Popular species of fish on these trips include red snapper, triggerfish, amberjack, and grouper. Near shore fishing tends to be a hybrid between the other two types of trips. these are generally on inshore boats or smaller center console boats. Usually the distance to shore is around 5 miles or less. Often times these are catch and release trips, trolling trips, or specialized trips like cobia or shark trips. 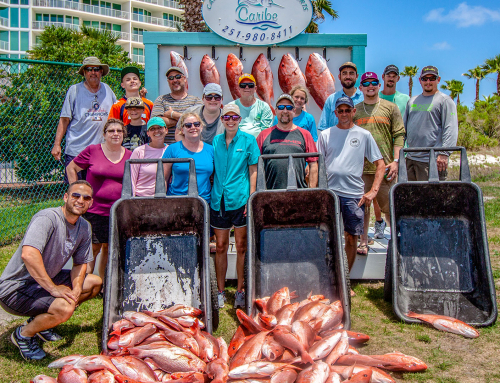 During red snapper season, these trips gain popularity for their cheaper prices and shorter time frame while still bringing the coveted red snapper to the dock. This question is trying to identify whether you want to go on a boat with just your group, or with other people that you don’t know. If you choose the private option, you can expect to pay more, but your experience will be more personalized. I use the analogy of a steakhouse and Mcdonald’s, you may pay more for the steakhouse, but the food will be better quality. A private trip is like the steakhouse. It is a trip that can be remembered for a lifetime. 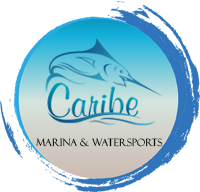 Walk-on charter fishing has gotten a bad reputation in the past due to overcrowding, but at Caribe Marina we do our best to keep the crowd manageable for the trip. We have customer limits below what the Coast Guard has set to ensure a positive fishing experience. The price is much more affordable and ranges from $49 a person to $175 depending on the length and type of trip. How many hours would you like your trip to be? This is one of the more important questions since it will likely determine how big your catch is and how deep the water is that you will be fishing in. 4 hour trips are either trolling trips or catch and release trips. These trips will bring back a small amount of fish to the docks, or none at all depending on the time of year. These are good for smaller children, or for budget conscious fisherman who still want to get a line wet. 6 hour charter fishing trips tend to be the most popular. You can expect an hour and a half ride to the reefs, about 3 hours fishing, and an hour and a half ride back. This is true bottom fishing in that everyone has their own pole and should see some significant action. Expectation should be to bring home enough food for dinner, but it is generally not a “freezer stuffing” trip. For the avid fisherman who are looking to “land the big one” we have 8 and 10 hour trips available. These trips will allow for more fishing action, as well as deeper water opening up additional species such as grouper, barrel fish, and golden tilefish. These trips can be done on both private and multi-passenger walk-on boats. These are the most common questions you will need to be prepared for when booking a fishing trip. Of course we have all kinds of trips for all kinds of budgets. If you have more questions feel free to email us at [email protected] or call us at (251) 980-8410. We would love the opportunity to talk fishing with you and let you know what is currently biting and what you can expect when you come to visit! 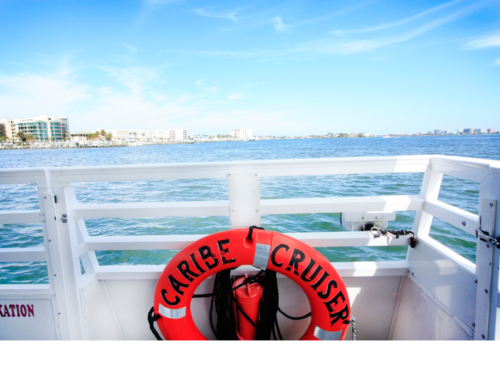 Choosing the Dolphin Cruise that is right for you!